Note: Go to this direct link to the online photo albums of this site. 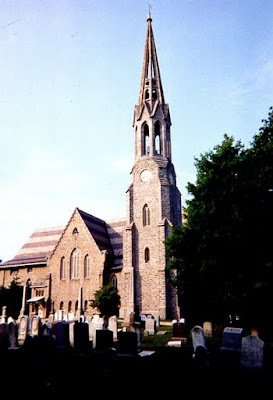 Often referred to as the Second Congregational Church Cemetery, this is one of the most significantly historical sites in the Town of Greenwich. Second Congregational Church actually owns Union Cemetery, located down the hill off Milbank Avenue. It is located at an exceptionally attractive site off the north side of East Putnam Avenue at the intersection with Milbank Avenue. The most prominent landmark is the 212-foot tall stone spire of the Second Congregational Church, which is found next to the burying ground. In the 1789 George Washington viewed the surrounding area from the summit of this hill, of which he later wrote, the superb landscape which is to be seen from the meeting house is a rich regalia. The church spire itself is the tallest structure in Greenwich, a conspicuous landmark that can be viewed from the waters of Long Island Sound. The New Burial Grounds Association was created in July 1833 as an independent organization. The original proprietors of the Association purchased the one and a half acres of land from Solomon Mead for $500. Plots were sold to the public without regard for religious affiliation. Another $440 was invested for necessary improvements, including the reconditioning of the surrounding stone walls. This tract of land was at one time owned by Angell Husted, one of the original proprietors of Greenwich. At the time of the purchase for the burying ground no buildings, including Mr. Husted's homestead, were situated here. The stone memorials viewed in this cemetery vary from humble markers to handsome, well preserved, and elaborately carved monuments, most of which are well preserved. A few brownstone gravestones that predate the creation of the cemetery were transferred from other sites many years ago, including a location where Temple Shalom is today. The majority of the stones here are marble and granite memorials. A number of fine examples of nineteenth century mortuary gravestone art can be viewed. Prime illustrations of carved weeping willow trees, embodying nature's lament, are found on the gravestones of Whitman Sackett (died 1868), Captain Daniel Merritt (died 1849), Prudence Mead (died 1849) and others. Some stones feature twin willow trees, evocative of the custom of planting marriage trees upon the exchange of nuptials. The elaborately carved monument commemorating the memory of Sophia, the only daughter of Isaac & Julia Peck (died 1861) features a rare specimen of a winged hour-glass, symbolizing the flight of time. Flowers adorn the gravestone of Caleb Husted, a child who died in 1857. A few of the markers are embellished with Masonic symbols featuring a crossed Compass and Square on an open book (the Bible). The gravestone for Civil War soldier Elnathan Husted, who died in battle, features some of the finest illustrations of military motifs. The New Burial Grounds Cemetery contains the final resting places of many who are famous in the annals of Greenwich history. Dr. Darius Mead, died in 1864, founded Greenwich Academy. He studied medicine in Philadelphia and eventually returned to Greenwich, where he married Lydia, the daughter of Dr. Elisha Belcher. Nearby is the grave of Dr. Mead's son-in-law, Philander Button. He is regard as one of the most important principals of Greenwich Academy, serving for 22 years. Mr. Button closed the Academy only once; in 1848 students were let go to witness the first run of the New York-New Haven-Hartford railroad as the train steamed through Greenwich. He was actively engaged in community affairs, including taking charge of recruiting men for the Civil War effort. Judge Frederick A. Hubbard contributed many written historical articles and recollections to New England newspapers and authored Other Days in Greenwich and a history of the Acacia Lodge, the local Free Masons organization. He served with distinction as a judge in the Greenwich borough court and represented the town in the General Assembly. Another judge, George W. Brush, served for 25 years as Justice of the Peace in Greenwich and presided over many important cases. He was so well-versed in law that during his tenure none of his decisions were ever appealed or overturned in a higher court. A number of military soldiers are buried in this cemetery. Major Daniel Merritt Mead, a lawyer by profession, died of typhoid fever while on sick leave after the battle of New Bern. Major Mead was the author of The History of the Town of Greenwich, the first authoritative book recording the chronicles of local history, published in 1857. Sergeant Caleb Holmes was killed in battle; part of his epitaph quotes a letter he sent to his mother. Jared Finch, died 1939, has the distinction of being the first Greenwich man to sign up for duty in the Civil War effort and the last Civil War veteran to die. Amos Mead, M.D. was a soldier in the Revolution and represented Greenwich in Hartford to ratify the federal Constitution. Several prominent ministers are interred at this cemetery. Rev. Rufus C. Putney served for 37 years as pastor of the Methodist Episcopal Church in Greenwich. Rev. Oliver Huckel, known as the Venerable Man of the Greenwich Clergy earlier in the twentieth century, was pastor of the Second Congregational Church. Dr. Huckel was wily known as the author of 30 books including The Old Church Tells Her Story and Four Epochs of World Conquest. He lectured on many subjects and was a leading authority on the musical dramas of Richard Wagner. It was during his term that the famous stone church spire was rebuilt, the church interior was rehabilitated, and the congregation celebrated its 225th anniversary. Dr. Joel Linsdley, also of the Second Church, was past president of Marietta College, Ohio. Other famous people from the past include members of the Holley family, long associated with the Holley Inn that became the headquarters of the Cos Cob School of American Impressionism. The Bush-Holley House was acquired by the Historical Society in 1957 and stands today with National Landmark status. Edward Lyon Holley was the brother of Constant Holley MacRae, the last owner of the house. Deacon Abraham Mead, whose pottery is sought by collectors and museums, is interred here with his family members. Another Mead character is a man called "the Venerable Sage of New Lebanon." Milo Mead, a rather eccentric bachelor, developed his lands in Byram into what he called New Lebanon. He took the name East Port Chester as a personal insult. The family of Solomon Mead, who owned the tract where the cemetery is now, are interred here. His house, located behind the Second Congregational Church, is today known as the Mead Parish House. From 1917 to 1919 the bell tower of the Second Congregational Church was methodically removed after it was discovered that the spire was disintegrating, each stone marked for reassembly. The scaffolds were supported by guy wires, one of which was connected in the cemetery. During a sudden windstorm sometime around Easter, 1918, the scaffolds collapsed into the cemetery and damaged a number of the gravestones. The New Burial Grounds Association still exists today. The cemetery is very well maintained and cared for by direct descendants of the founders and plot holders. It is an age-old historical site featuring a "Who's who" of Greenwich history. A stroll among the tombstones for those in search of Greenwich's historical legacy is strongly recommend.